Thalassemia is a blood disorder passed down through families (inherited) in which the body makes an abnormal form or inadequate amount of hemoglobin. Hemoglobin is the protein in red blood cells that carries oxygen. The disorder results in large numbers of red blood cells being destroyed, which leads to anemia. Thalassemia occurs when there is a defect in a gene that helps control production of one of these proteins. Alpha thalassemia occurs when a gene or genes related to the alpha globin protein are missing or changed (mutated). Beta thalassemia occurs when similar gene defects affect production of the beta globin protein. Alpha thalassemias occur most often in people from Southeast Asia, the Middle East, China, and in those of African descent. Beta thalassemias occur most often in people of Mediterranean origin. To a lesser extent, Chinese, other Asians, and African Americans can be affected. You must inherit the gene defect from both parents to develop thalassemia major. Thalassemia minor occurs if you receive the faulty gene from only one parent. People with this form of the disorder are carriers of the disease. Most of the time, they do not have symptoms. Beta thalassemia major is also called Cooley anemia. The most severe form of alpha thalassemia major causes stillbirth (death of the unborn baby during birth or the late stages of pregnancy). Children born with beta thalassemia major (Cooley anemia) are normal at birth, but develop severe anemia during the first year of life. People with the minor form of alpha and beta thalassemia have small red blood cells but no symptoms. Your health care provider will do a physical exam to look for an enlarged spleen. A blood sample will be sent to a laboratory to be tested. Red blood cells will appear small and abnormally shaped when looked at under a microscope. A complete blood count (CBC) reveals anemia. A test called hemoglobin electrophoresis shows the presence of an abnormal form of hemoglobin. A test called mutational analysis can help detect alpha thalassemia. Treatment for thalassemia major often involves regular blood transfusions and folate supplements. If you receive blood transfusions, you should not take iron supplements. Doing so can cause a high amount of iron to build up in the body, which can be harmful. People who receive a lot of blood transfusions need a treatment called chelation therapy. This is done to remove excess iron from the body. A bone marrow transplant may help treat the disease in some people, especially children. Severe thalassemia can cause early death (between ages 20 and 30) due to heart failure. Getting regular blood transfusions and therapy to remove iron from the body helps improve the outcome. Less severe forms of thalassemia often do not shorten lifespan. You may want to seek genetic counseling if you have a family history of the condition and are thinking of having children. Untreated, thalassemia major leads to heart failure and liver problems. It also makes a person more likely to develop infections. Blood transfusions can help control some symptoms, but carry a risk of side effects from too much iron. You or your child has symptoms of thalassemia. You are being treated for the disorder and new symptoms develop. Cappellini MD. The thalassemias. In: Goldman L, Schafer AI, eds. Goldman-Cecil Medicine. 25th ed. Philadelphia, PA: Elsevier Saunders; 2016:chap 162. Chapin J, Giardina PJ. Thalassemia syndromes. In: Hoffman R, Benz EJ, Silberstein LE, et al, eds. Hematology: Basic Principles and Practice. 7th ed. Philadelphia, PA: Elsevier; 2018:chap 40. DeBaun MR, Frei-Jones MJ, Vichinsky EP. Hemoglobinopatiies. In: Kliegman RM, Stanton BF, St. Geme JW, Schor NF, eds. Nelson Textbook of Pediatrics. 20th ed. Philadelphia, PA: Elsevier; 2016:chap 462. Thalassemia major is an inherited form of hemolytic anemia, characterized by red blood cell (hemoglobin) production abnormalities. This is the most severe form of anemia, and the oxygen depletion in the body becomes apparent within the first 6 months of life. If left untreated, death usually results within a few years. 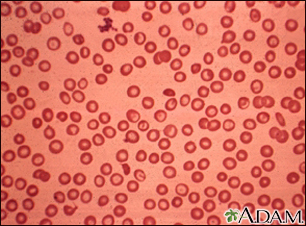 Note the small, pale (hypochromic), abnormally-shaped red blood cells associated with thalassemia major. The darker cells likely represent normal RBCs from a blood transfusion. Thalassemia minor is an inherited form of hemolytic anemia that is less severe than thalassemia major. 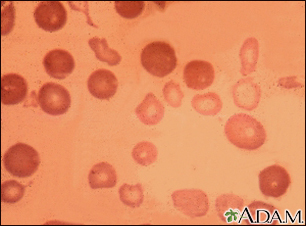 This blood smear from an individual with thalassemia shows small (microcytic), pale (hypochromic), variously-shaped (poikilocytosis) red blood cells. These small red blood cells (RBCs) are able to carry less oxygen than normal RBCs.